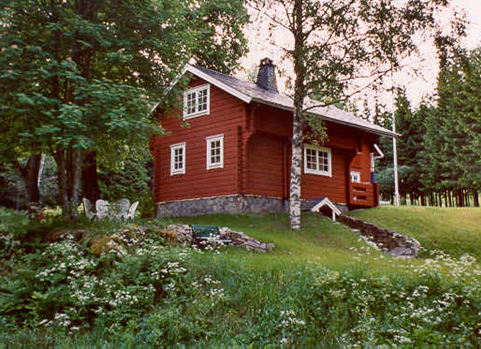 Log cabin built 1999. Finished to a high standard. Area 45 m2. Large room with dining space and radio with cd player. Spacious sleeping place upstairs, four beds and place for child’s bed. Well-equipped kitchen area with electric cooker, oven, toaster, fridge and freezer. stove heating. Furnished balcony and barbecue. Grounds with extensive facilities for games and play for kids. Natural surroundings for excursions. 200 metres to lake Nacketjärnet with fishing grounds. Rent includes two bikes, rowing boat, big Canadian canoe and an optimist. 600 metres to our own swimming place. Peaceful environment. In wintertime skis and sledge for children. 30 km to downhill skiing at Edsleskog.